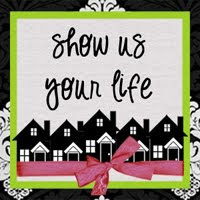 This week for Show Us Your Life at Kelly's Blog, the subject is wedding showers. During my engagement I blogged about our 'regular' showers, but I never put together a post about my personal shower thrown by my bridesmaids. 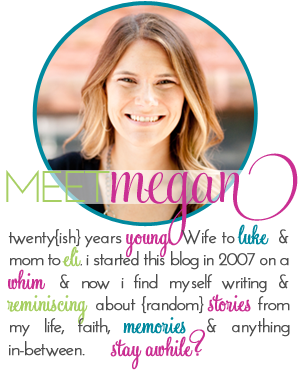 I got wrapped up in wedding mode and never had time, and then when I had time to put together a post it was too late. So I figured this would be a good time. 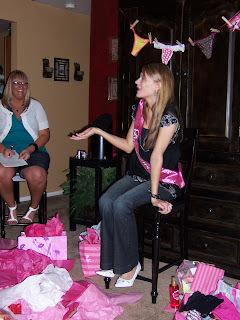 My personal shower was thrown by 3 of my bridesmaids: Kara, Jodi, and Tambra. They did such a great job. It was a fun night of hanging out with friends celebrating my upcoming marriage, while getting lots of great presents. First we started the night with presents. Contrary to popular belief I do not like being the center of attention. Seriously, I don't like it. So opening gifts in front of people is always really weird for me. At my shower before I could open a gift I was asked a question and I had to correctly answer what Luke's response was. I can't remember, but I think I did pretty well. Here I am answering questions: I think in this question I am trying to justify my answer. After opening presents we went downtown for the night, they made me wear this horrible veil with some unmentionable male-parts on them, as you can tell from the picture I was not happy and little disgusted: I am beginning to think I am modest and conservative. Wearing male-parts on my head is not my cup of tea. 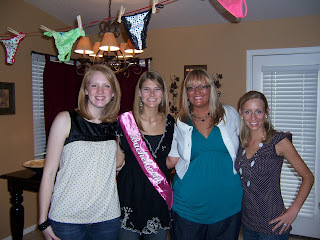 It was a good night and I am thankful for good friends who put together a great shower for me! It only took me a whole year to finally get the post up! I am curious about this term "personal shower?" I think I heard it on another blog too, I wonder if it is more of a southern term? Is just a prettier word for "bachelorette party?" P.S. I think Ryan Seacrest would be a great BFF! But seriously, what a cute shower! Hope you are still enjoying your gifts. PS - Have fun at your wedding today! I'd never heard of "personal shower" either until someone else mentioned it on a blog. I guess it's a more ladylike term for "lingerie shower" or "bachelorette party"? I've never made any of my friends wear male anatomy around town, at their parties. I'm hoping they'll return the favor when it's my turn, lol. What a fun time, though! You look so ticked in that picture! Oh man! I would not have like that either. I totally would have guessed Ryan for your crush too!!! I love the pic of you on that veil! You look so pleased. I too am wondering what a personal shower is? I think I posted about this once, but I had also never heard of a couples shower until I went to a friend's a little bit ago. How many showers did you have? I love that idea of guessing what Luke would guess for you!! I'm going to have to steal that for a shower I"m planning for a friend soon! :) And I'm just like you--I'm pretty modest, and uh er prudish, so those kinds of showers make me a little uncomfortable! Cute party though, and you look adorable!! Your face with that veil on is hilarious!!!! Love it, you are so cute!! great showers! I am the same way about opening gifts. During my wedding showers I always hated that part. Where everyone got quiet and I had to open the gifts. Especially opening the gifts at my personal shower. I never get embarrased but I think my face actually turned red!